In the 1920s, 1930s and 1940s, carnival rides and big band leaders such as Glenn Miller and Tommy Dorsey attracted crowds to the island now known as �The Edge of America� from up and down the East Coast. By day, visitors would lie in the sun and play in the warm waters of the Atlantic Ocean. By night they would dance to some of the biggest names in music at the Atlantic Pavilion. 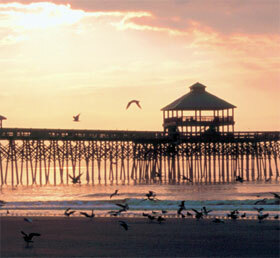 Folly Beach also played a role in producing a great American folk opera. George Gershwin holed up in a bungalow at 708 West Arctic while composing �Porgy and Bess,� which was first performed in 1935. He also reportedly judged a local beauty contest while he was in town. Just eight miles south of downtown Charleston, about a 15-minute drive, Folly Beach is ideal for those who enjoy the sun and surf in a laid-back environment that isn�t far from the dining options and entertainment offered in the more �civilized� world.